The exhibition was held in the Rare Books Exhibition space, Sir Louis Matheson Library, Monash University from 27 May - 26 June 2002. The exhibition includes editions of musical scores rarely seen outside Korea. Recordings of traditional, folk and contemporary art music were on display as well as a collection of modern Korean objects. 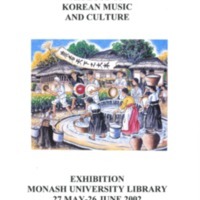 Exhibition organized by the Monash University School of Music-Conservatorium, in association with Korean Studies, School of Languages, Cultures and Linguistics; the Monash Asia Institute; and Monash University Library. Special thanks to Jung-Sim Kim, and Aline Scott-Maxwell, Asian Studies Research Library, Richard Overell and Lorraine David, Rare Books Collection, and Georgina Binns, Music Library.